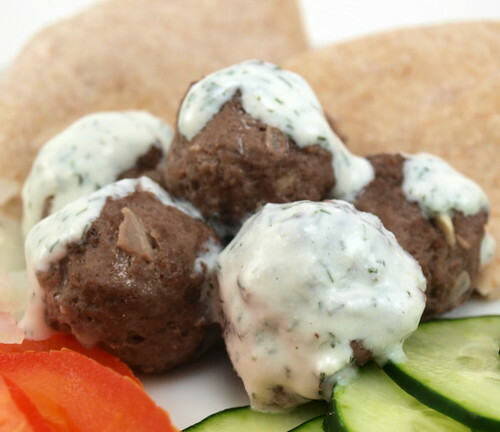 Not long ago I had lunch at a little Lebanese restaurant and I discovered some really wonderful new dishes. One of these was shawarma, a meat mixture that is marinated in a spice blend, placed on a spit, and slowly grilled. 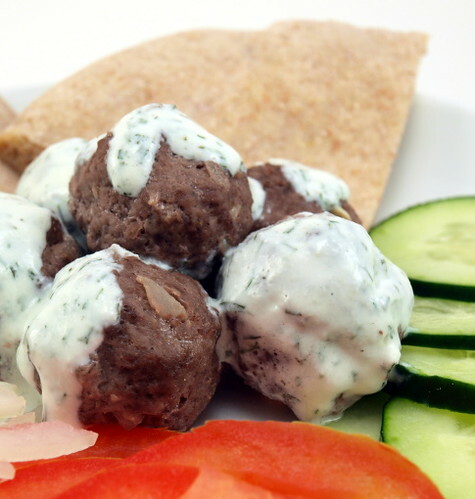 It is sliced thin and served with pita and other fresh garnishes. It is very similar to a gyro but with distinctly different spices. I fell in love! The restaurant owner, of course, would not share their recipe for the spices so I had to do some research and testing. Just from tasting the meat I knew allspice featured heavily in the mix, as did cardamom. After that I was stumped. After some experimenting I decided to add a little cinnamon and coriander which add an earthy depth and punch up the flavor of the allspice. My version is not at all traditional. Without the large cone shaped spit there was little hope that I could create the exact same texture, so I decided on small meatballs. 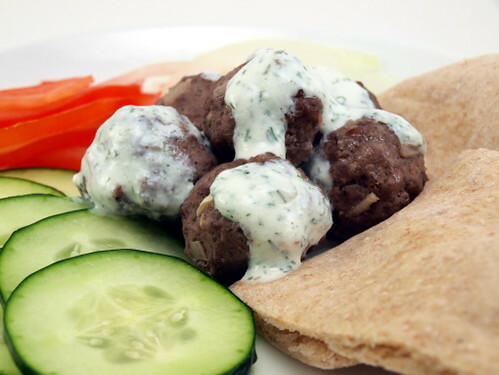 They are easy to stuff in some fresh, soft pita bread and the outsides get delightfully crusty under the broiler which approximates the texture of the spit roasted meat. All I added was a cool cucumber and yogurt sauce to go over the top. Make this when you are feeling exotic and you will not be disappointed! Begin by making the sauce. 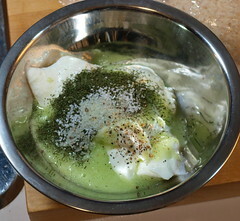 In a blender combine the garlic and cucumber. Blend until very smooth. 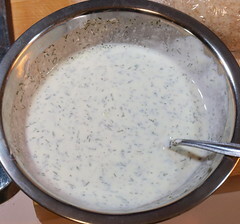 In a small bowl combine the cucumber mixture, lemon juice, yogurt, dill, salt, and pepper. Mix well, then cover and chill for at least an hour. Heat the broiler and line a sheet pan with foil sprayed with non-stick spray. 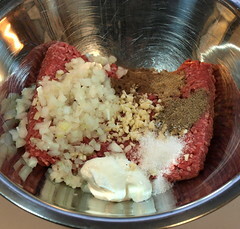 In a large bowl mix the ground beef, garlic, yogurt, spices, lemon juice, and onion until well combined. 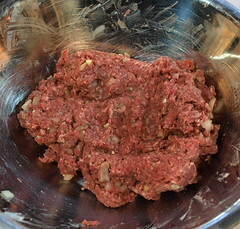 With a small disher, about two tablespoons, scoop out the meatballs into the prepared sheet pan. 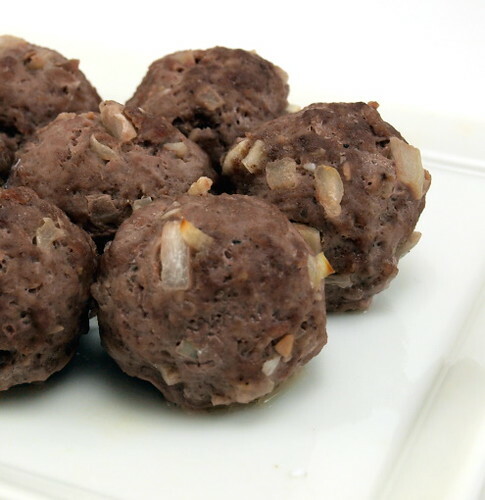 You should get between 25 and 30 meatballs. 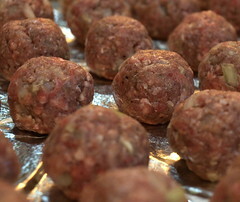 Cover and let the meatballs stand, at room temperature, for thirty minutes. Once rested broil for 15 to 25 minutes, or until the meatballs reach an internal temperature of 155 F and are well browned. Cool for ten minutes, tented loosely with foil, before serving. Serve with the garnishes and sauce. Enjoy!